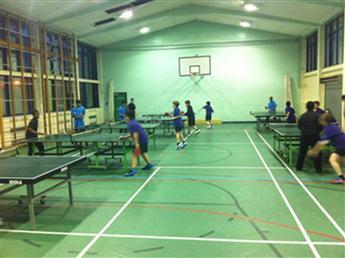 JCoSS travelled to Whitefield Academy to compete in a 12-man table tennis competition. With the weighty burden of expectation upon their adolescent shoulders they certainly did not disappoint. With the abundance of talent in this JCoSS squad the result was a formality, but by how much was dependant on the form of their captain, Jamie Lesser and his prodigal players. With each student playing in 9 separate singles matches there was plenty of points to play for. Ryan Isaacs got the team off to a flying start with Tom Stepsky and Jamie Lesser soon following this up with convincing wins over their inferior counterparts. The points kept coming as in-form Alex Bogen, Saul Shimoni and Sam Taylor practically dismembered their opposition with some fierce forehand body shots. James Rich and Jonathan Sinyor began confidently by playing some nonchalant table tennis against opposition 3 years their senior. The wins just kept on coming and it wasn’t long before the lads had notched up an unassailable lead. The boys eventually came out on top 7-4 thanks to some outstanding match winning performances from Gabriel Platt, Hadley Shapps and Austin Gershon.